Below is a complete list of all the Costa Brava camping sites in L’Escala. BUT before you look through the list of L'Escala camping sites...please click here to open in a separate window...How The Camping Costa Brava Accommodation Directory Works? Want to see if L’Escala beaches are the beaches for you? Take a look at the pictures of L’Escala and sneak a peek at the beach webcam. 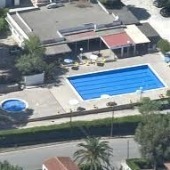 Description: There are electric and non-electric pitches, mobile homes and bungalows at Camping Cala Montgo. This large campsite has everything a camping family could want – restaurant, supermarket, bar, cafeteria, laundry, showers, car wash, postal service, currency exchange, tennis, horse riding, swimming pool...all set in acres of pine wood. Location: Camping La Escala is located just two blocks back from the Passieg de Mar on the seafront of L’Escala, below the old town and also a short walk from the Riells beach area. Description: There are electric and non-electric pitches and bungalows (in a separate part of the campsite). This Costa Brava campsite is perhaps less oriented to family camping because there is no swimming pool or play area (but this might be what you prefer as a family or if you are childless it might hold more appeal!). 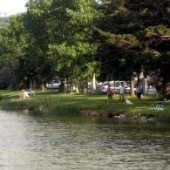 This small-medium sized campsite has bar, supermarket and laundry in lovely grassy and shady area of town. 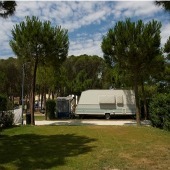 Location: This Costa Brava campsite is located only 100 metres from Riells beach. It’s a nice location on the banks of small lake. Description: There are electric and non-electric pitches. Camping Maite has all the basic services such as restaurant/bar, café, children’s play area and supermarket. Pets are allowed. 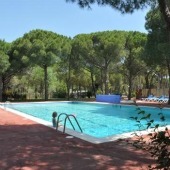 Location: This Costa Brava campsite is situated at Cala Montgo which is about 3km drive from L’Escala town. The beach at Montgo is lovely and this campsite is located in beautiful pine woods only 15 minutes walk from the waves – yeah! Description: Camping Neus has free Wifi throughout the site, an internet café, supermarket, bar, pizzeria, table tennis, kids playground, 2 swimming pools (one for children), tennis and basketball courts. What else? Ah yes, there are volleyball courts, children’s entertainment and pets are allowed. Location: The Illa Mateua Camping Resort is located in Illa Mateua cove, in the Cala Montgo area in a similar area to that of the Camping Neus. Check out the view from the swimming pool - wow! Location: A short walk directly down from Riells beach, Camping Riells is in a good location for both Riells beach and L’Escala town centre. Description: There are electric and non-electric pitches. Good value for a central campsite with more facilities than usual in such an urban location – restaurant, supermarket, swimming pool, kids playground. Pets are allowed.